When you watch a Rideau Canal lock in operation you are looking at a marvellous engineering system that uses water, gravity, human muscle power, and a basic system of levers and gears to move boats up and down from one water level to another. This section of the website is an on-line presentation of a paper brochure produced by Friends of the Rideau titled "How A Lock Works". 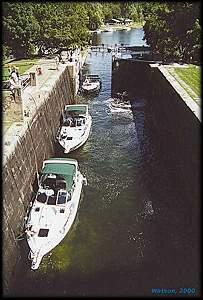 You can view or download the "How A Lock Works" brochure (290K Adobe PDF file) to print out and take with you on your next visit to a Rideau Lock. Lock: a watertight chamber with gates at either end used for raising or lowering boats between differing water levels by means of sluices and valves that let water in and out of the chamber. How A Lock Works Brochure: View or download the "How A Lock Works" brochure (the brochure is this section of the website in tri-fold brochure format). This brochure is an Adobe PDF file (290K). If you don't have Adobe's free reader, go to Adobe's website to get it. For more Rideau lock information see: The Basics of a Rideau Lock (please note: this will take you off the Friends of the Rideau website - so bookmark this location first).